WePay, a Y Combinator backed startup that aims to take the hassle out of group paying, is launching to the public today. 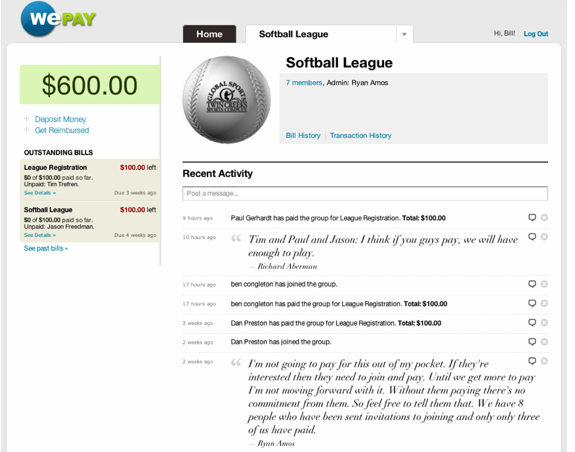 As we wrote in our initial coverage of the payments platform, WePay is an easy way to collect, manage and spend money for groups. WePay’s core architecture is based around a prepaid debit card system, which makes its accounts not only easy to set up but also more flexible when it comes to setting up group paying. So with PayPal, your account is tied to your name, without any way to separate the payments associated with a group. On WePay, you can create a unique, FDIC insured account for each group. While the account is still associated with your name, but you can keep each group account totally separate from your personal transactions. Group money can essentially be kept separate from any individual accounts you may have. You can also designate specific individuals to have control over accounts. From accounts on WePay, users can send emails with electronic bills (which can be paid with bank accounts or credit cards) and spend funds with a WePay VISA prepaid card, paper checks, or electronically. If group members don’t pay soon, the site will automatically remind them a few days later. WePay makes money by charging a 3.5% transaction fee (there’s also a different plan that charges 50 cents per transaction and limits you on the methods of payment you can accept). The site has been in private beta for the past six months but has received positive feed back from its limited number of users. Co-founder Bill Clerico likens PayPal to the payment equivalent of email (meaning its more targeted towards exchanging information or money between two separate parties) and WePay as the payment equivalent of Facebook, in that there is one central place for everyone to see the latest information, and payments are exchanged between many parties. As we wrote in December, all signs point to WePay being a winner, and viable competitor to PayPal in the group payments space. And a number of notable investors and technology executives seems to think so as well. In addition to funding from Y Combinator, the site has raised $1.65 million from August Capital and angel investors, including PayPal cofounder Max Levchin, PayPal alum Dave McClure, FriendFeed co-founder Paul Buchheit, Ron Conway, Mark Goines, Andrew McCollum, Joe Campanelli, and Angus Davis.